The already battered Snap was hit hard amid broader market selloffs last month. Shares of Snap (NYSE:SNAP) sank 22.1% in October, according to data provided by S&P Global Market Intelligence. The struggling social-media stock hit a new lifetime low in the month, and it's now down roughly 50% on the year despite climbing roughly 10% in November's trading. Shares generally moved in line with the broader market last month, but the stock also lost ground following the company's third-quarter earnings release. Snap published results for its September quarter on Oct. 25, and shares sank to an all-time low in the wake of the report. 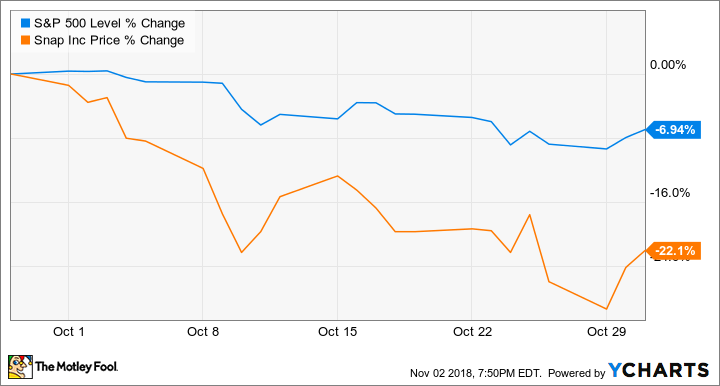 Snap is a growth-dependent tech stock with a questionable business outlook, so it's not surprising that it was hard-hit amid the broader market's pullback last month. However, its recent earnings release also arrived with some worrying indicators. Daily active users (DAUs) on the company's Snapchat social media platform declined 1% sequentially, notching the company's second consecutive quarter of DAU declines and adding to skepticism about the platform's longevity. The beleaguered camera and social media company's third-quarter results actually came in well ahead of the market's expectations, but the sales and earnings beat was less thrilling amid more signs that Snapchat is stagnating. Revenue for the period climbed roughly 43% year over year to reach $298 million -- topping the average analyst estimate's call for sales of $283 million. The company's loss per share also beat expectations, coming in at $0.12 compared to the average analyst target of a $0.27 per-share loss. 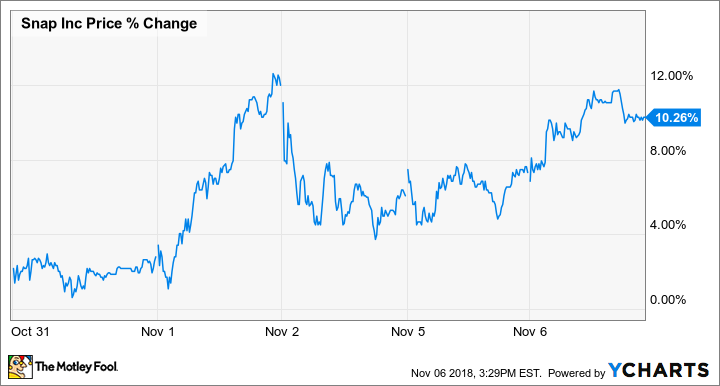 Snap shares have regained some ground in November, trading up roughly 10.3% in the month so far and corresponding with a rebound for the broader market. SNAP Price data by YCharts. The company has a sizable user base on its social platform (186 million daily active users as of September) and may look cheap after big sell-offs this year, but concerns about the business's path forward aren't unwarranted. Facebook's Instagram platform has replicated many of Snapchat's signature features -- and the larger, more resource-rich social media company is in good position to incorporate (and improve upon) innovations introduced by its smaller competitor. Snap is making moves to better incorporate e-commerce and improve ads on its platform, but management is guiding for another quarter of DAU declines, and the company needs a solution to its engagement problem to support those initiatives over the long term.